This hilarious comedy, written by David Tristram, is the perfect antidote to the stresses of the day. 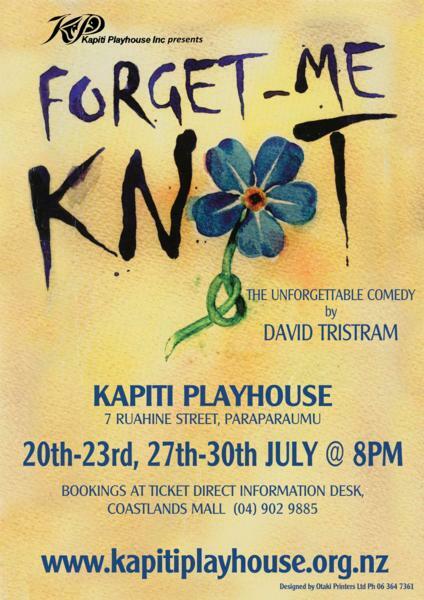 Come and have fun with us at the Kapiti Playhouse, Paraparaumu, Wednesdays to Thursdays 20th to 30th July at 8 pm. Ever suffered from memory loss? Imagine the predicament of poor Robert Zeinfeld. Found wandering the streets at 4am, without a clue how he got there. Total amnesia! The policeman has to establish who Robert is. Perhaps he hasn’t lost his memory at all. Perhaps it is all an elaborate cover up. The more the policeman digs, the more confused he gets, until he finds himself wrestling a plot with countless twists. Playwright David Tristram has created a hilarious play from an usual situation. Tickets from the TicketDirect Information Desk in Coastlands Mall phone (04) 902 9885.